Findings implicate dysregulated MUC5B expression in disease pathogenesis. Researchers claim a common SNP in the putative promoter of the MUC5B gene appears to be strongly associated with the development of both familial interstitial pneumonia (FIP) and idiopathic pulmonary fibrosis (IPF). Their studies, which started with an initial linkage analysis in 82 affected families, pinpointed the variant and found that it was carried by nearly two thirds of patients with either FIP or IPF. Previous research has provided substantial evidence of a genetic basis for idiopathic interstitial pneumonia, report Sanjiv Sam Gambhir, M.D., and colleagues. However, while familial aggregation has been confirmed through studies in twins, siblings raised apart, and multigenerational families, genetic mutations implicated so far could collectively only account for a small proportion of the population risk of the disease. To try and identify a more concrete genetic association, the researchers used a genome-wide linkage scan to identify a risk locus for idiopathic interstitial pneumonia on the p-terminus of chromosome 11. The researchers identified and phenotyped subjects with FIP or IPF from 82 families in which there had been at least two cases of either disease within three generations. To further interrogate the resulting linked region on the p-terminus of chromosome 11, fine mapping was carried out by genotyping SNPs in unrelated subjects with FIP as well as subjects with IPF and controls. The findings were then confirmed and extended through a case-control association study in an independent population of subjects with FIP, sporadic IPF, and controls. The studies, combined with mucin gene resequencing, homed in on a SNP in the putative promoter of MUC5B, 3 kb upstream of the transcription start site. The SNP, designated rs35705950, exhibited the strongest association with both FIP and IPF. The minor allele of the SNP was present in 34% of subjects with FIP, 38% of patients with IPF, but just 9% of controls. The odds ratio for disease among subjects who were heterozygous and those who were homozygous for the rarer allele of the SNP were 6.8 and 20.8, respectively, for FIP, and 9.0 and 21.8, respectively, for IPF. 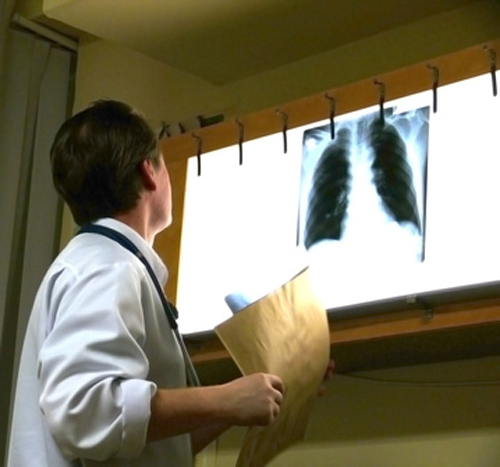 The researchers further found that subjects with IPF had significantly higher levels of MUC5B expression in their lungs than controls, and the protein was also expressed in IPF lesions. MUC5B expression was 14.1 times higher in the lung tissue of IPF subjects than among unaffected controls. Moreover, expression of the gene among unaffected subjects carrying at least one copy of the variant allele was 37.4 times as high as it was among unaffected subjects who were homozygous for the wild-type allele. Dr. Gambhir and colleagues admit that the mechanisms for excessive lung injury or aberrant repair in carriers of the MUC5B promoter SNP remain unknown. However, they suggest that their findings point to at least three possibilities. One is that too much MUC5B impairs mucosal host defences and results in excessive lung injury from inhaled substances, which over time leads to disease development. A second possibility is that excess MUC5B in the respiratory bronchioles may interfere with alveolar repair. A third is that since the SNP occurs in the putative promotor for MUC5B, it could disrupt transcription binding sites and potentially cause ectopic production of MUC5B in cells or locations that cause injury to the bronchoalveolar unit.